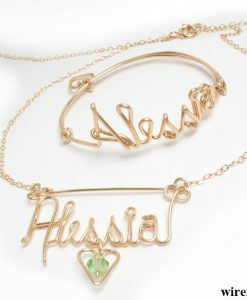 We can craft unique gold or silver personalized name bracelets. 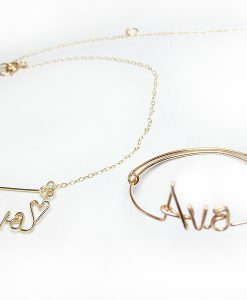 Getting a personalized name bracelets will make your gift so much better than those of the general crowd. 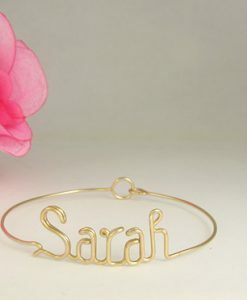 If it is for yourself personalized name bracelet, then be assured that you will be attracting a lot of compliments. You can also play with the basic design of the bracelet. If you want it simple, then you can choose it to be only wire. For something loopier, we offer to craft hearts along with the names. You can choose bracelet to be name and chain around wrist. There is also the option of crafting more than one name on a bracelet. You also have the option of incorporating a birthstone in your gift if you gifting it on someone’s birthday. However, if you want specific changes and incorporations that are not listed, you can contact us. We will hear you out and make your bracelet even more personal. 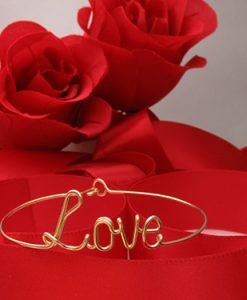 You will not find such flexibility anywhere else, so let us make your special wire name bracelet. We have specialized in custom bracelets and name bracelets for almost thirty years, which makes us vastly experienced in the field. We are the best in our trade! Dainty bracelets can transform your entire look, and when they are custom bracelets, there is an added personal element too. If you want a mom bracelet for your mother on her birthday, then we will make you a precious bracelet that she will adore. If you feel like giving your baby something special, our baby bracelets and especially infant bracelet are the perfect contenders. We do not believe in mass production, and our objective is to handcraft all wire bracelets with love. When you purchase a customized bracelet from us, you will know that the trinket is unique and personal to the specific person it is meant for. When you approach us with the design you have envisioned, we will stick to all your preferences. We want to give your abstract idea a real form. Getting a name bracelet personalized will make your gift so much better than those of the general crowd. If it is for yourself, then be assured that you will be attracting a lot of compliments. Customize it! The wire name bracelet can even display non-English names. You can also have a special nickname created on the bracelet. Sounds good right? Personalize the bracelet by inputting your preference among the wide variety of customization options we offer. The material of your wire can either be lustrous 14K gold or sophisticated sterling silver. The list of sizes makes sure that nobody is deprived of the joy of owning their very own gold name bracelets or silver name bracelets. You can also choose from a beautiful range of hanging charms. Want charms in unusual shapes like that of a tooth, bone or megaphone? We have it. Are you looking for sporty charms related to volleyball, tennis and lacrosse? Scroll down the list. You also have the option to make a unique charm by giving us instructions. If you want to pack your love into a pretty box, then check our list of jewelry gift boxes. You also have the option of incorporating a birthstone in your gift if you gifting it on someone's birthday. You can also play with the basic design of the bracelet. If you want it simple, then you can choose it to be only wire. For something loopier, we offer to craft hearts along with the names. There is also the option of crafting more than one name on a bracelet. Contacting us is easy! Our website has extensive galleries and lays out all the options in a simple manner so that you face no problems when customizing your wire bracelets. However, if you want specific changes and incorporations that are not listed, you can contact us. We will hear you out and make your bracelet even more personal. You will not find such flexibility anywhere else, so let us make your special wire name bracelet.